If you think again about your life, it's quite simple to understand why you can't enjoy your life today. You think it's because of your situation, but it is not. There are only two reasons why you don't live well today. It's always either your past or your future. It is never because of the problems in your life today. There's nothing wrong with today, only yesterday or tomorrow. The past is not here anymore. The thing is, the past is already in the past. No matter how hard you try to change the past, you just can't. Perhaps your past did wrong things to you and brought you a lot of regrets. It might be unfair. You might get bitter or angry when you look back. But it's not real anymore today. It was only real yesterday. You may say, "But it's so real. I can still feel the pain today. My past makes my life harder today." Yes, maybe. Why? You feel that way because you don't let it go. But still, it's not real today. It's only real in your mind, not in reality. The only way to stop the pain, bitterness, and regret is to let it go. You may say again, "It's easy for you to say that. You think it's that easy to let it all go after everything that happened to me?" Yes, it's not easy. It's hard to let go, especially when you really love the things you have to let go. It happened to me. It happened to me many times, actually. And I admit it's really hard. But think again, what's the point in holding on something that has already gone? It doesn't change anything. It just makes everything seem worse. You can't change your past to be better. The only thing you can do is to make your life today better, by letting go of your past. When you're brave enough to let go of your past, no matter how hard or unfair it is, you're free to live today without burden anymore. Your past may affect your life today, but it doesn't have to keep haunting you. Your past doesn't determine your future when you don't let it hold you back. What's the point in holding on something that has already gone? It doesn't change anything. It just makes everything seem worse. You can't change your past to be better. The only thing you can do is to make your life today better, by letting go of your past. If it's not your past that makes you can't enjoy your life today, then maybe it's because of your future. Nobody knows exactly what will happen in the future. It's full of uncertainty, so people start guessing and thinking of all the possibilities. They make a lot of assumptions based on what they see today. The problem is, most of them pay more attention to the bad ones. Many people worry too much about the future. They're afraid of something bad that can happen, so they feel pressured, which can really distract their present. Like the past, what you think about the future is also not real. It's real in your mind, but not in your present. You're not there yet. You're still in here, in this time called present. There's no guarantee what you worry will really happen. I don't say that it won't happen. Anything is still possible to happen, either the good or bad ones. But, why do you waste so much energy today and sacrifice the enjoyment of your life today just for something you're not sure about? It doesn't mean you should ignore your future, but it also doesn't mean you should just assume the worst. It's still important to prepare and doing something for your future, but preparing for it is totally different with worrying about it. You can do something without worrying about it. You can also worry without doing anything. 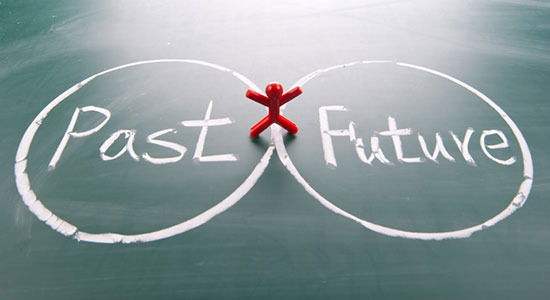 People who prepare for future enjoy doing something because they see it as a process and a journey. They feel alive to set goals and dreams. They feel encouraged to reach it. They live in the present very well. They expect to see the bright side of the future. On the other hand, people who just worry are afraid of something bad to happen, but they always think and focus on the dark side of the future. They let themselves lose their happiness today for something they don't know. They fear the bad things, but they keep waiting for it to come. It doesn't mean you should ignore your future, but it also doesn't mean you should just assume the worst. It's still important to prepare and doing something for your future, but preparing for it is totally different with worrying about it. You can do something without worrying about it. You can also worry without doing anything. There's nothing better than to enjoy your life today. Be grateful for it and live it as a precious journey. You can learn from your past, but focus on the now. Look back only to pick the great lessons you can learn, so you can live a better life today. You can also prepare for your future, but focus on the now. Look ahead only to see what you can do today to prepare for the better things in future, not to worry about it. Whatever it is, don't let anything from your past or future steal your happiness today. They're from different time. You're in this time, called present.